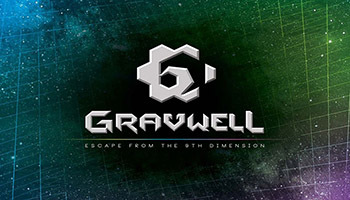 In Gravwell: Escape from the 9th Dimension, players command spaceships that have been pulled through a black hole, transporting them into a different dimension. With each ship lacking fuel to get home, each player must collect basic elements from surrounding asteroids, using the gravity of the dimension and what little resources they have in order to reach the warp gate that will take them home. But in this dimension, moving ships will travel towards the nearest object, which is usually another ship, and when those objects are moving either forward or backward, reaching the warp gate isn't always easy. 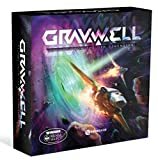 Time is running out to save your crew and your ship! 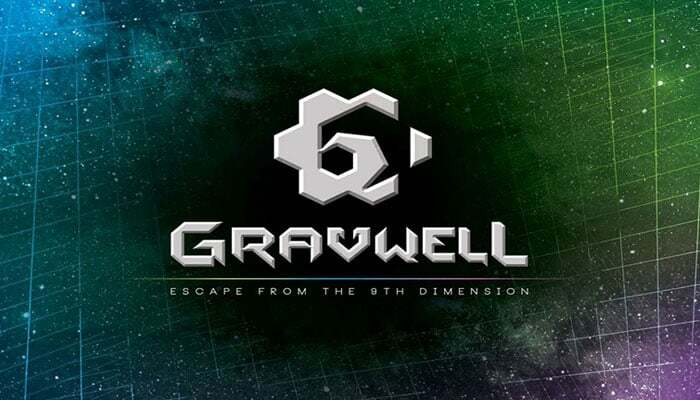 As a grim reminder of the cost of failing to escape, the frozen hulks of dead spacecraft litter the escape route - but with careful cardplay, you can slingshot past these derelict craft and be the first to escape from the Gravwell! This easy-to-learn game uses 26 alphabetized cards to determine movement order and thrust; most cards move your ship towards the nearest object, but a few move you away from it. Players will draft fuel cards in each round - picking up three pairs of two cards, with only the top card of each pile being visible - giving you some information as to which moves you can expect from the other spaceships. During a round, each player will play all of his fuel cards in the order of his choosing. During each phase of a round, each player will choose one card, then all cards are revealed and resolved in alphabetical order. When your opponents move in ways you didn't expect, you won't always be heading in the direction you thought you would! Each player holds an "Emergency Stop" card that he may tactically play only once per round to avoid such a situation. You're among a flotilla of four ships that survived passing through a black hole. The fabric of space and the general physics you've known have changed. You have entered a new physical dimension where even gravity behaves differently. By mining asteroids and collecting basic elements from space dust (some never before encountered ), you muster just enough thrust to move your spacecraft. You typically travel toward the nearest object, usually another ship. But they may not be where you thought. You will play as one spaceship as usual, but you will also move a Ghost Ship, piloted by pure chance. Place your spaceship and one other into the Singularity and place one derelict on space #36.